Show some "bunny" you love them with an Easter baby shower theme. Since Easter occurs at spring time, you could do a nesting or flower/spring baby shower. Guess the jellybeans- Place a jar filled with jellybeans close to the entrance for guests to guess the number of jellybeans as they arrive. The person who gets closest to the actual amount of jellybeans wins the jar. Baby Trivia- Since Easter is the time of "new life", this fun trivia game can be a great starter for your party. See how much your guests really know about babies for some head scratching fun! Download the baby trivia here. Easter Bunny Bingo- Fill a bingo card with Easter related words for guests to play a fun match of bingo. Hand out jelly beans or pastel m&ms for them to cover their squares with. When they have a row filled they need to call out "Easter Bunny" to get their prize! Place plastic eggs and colored hard boiled eggs in pretty dishes and place around the room. Place some candy eggs and jelly beans or other Easter candy for guests to enjoy during the shower. Use pastel colors to decorate your room. Hang pastel balloons and use solid pastel colors for your tableware. This cute chevron tableware set can also add a nice touch to your spring table.Decorate the room with stuffed bunnies and baskets. Flowers are a beautiful expression of spring and new life. Place a pretty bouquet of flowers in a vase as your centerpiece. My favorite flowers to use are colored tulips or gerbera daisies. Springtime is a season of refreshing rain and beautiful colors. Create a food table full of light and refreshing food to match the season. Here are some ideas to get you started. For a portable finger food, place a few baby carrots and celery sticks in a clear cup with ranch dip at the bottom. Some other ideas could be deviled eggs, banana split cake, refreshing punch, Chinese chicken salad, garden pizza, and light and puffy cake. 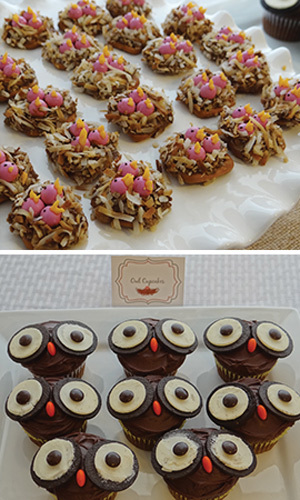 Get the full details on making these cute bird pretzels and owl cupcakes on our owl baby shower page. What person does not like candy? Use Easter candy as prizes for your Easter baby shower games and activities. Melt chocolate chips with butterscotch chips in a medium sized container in the microwave in 30 minute increments until fully melted (stirring after each increment). Mix with peanut butter until fully combined. Pour over chow mein noodles and stir until noodles are fully coated. Butter 2 cupcake pans, making sure to get them fully coated. Evenly separate mixture between 24 cupcake tins. Use the back of your spoon to indent the centers of the birds nests until they look somewhat realistic. Place cupcake pans in fridge and let set for around 2 hours. Remove pans from refrigerator and pull each bird nest out of the cupcake pans. (I used a butter knife to help pop mine out. ;) ) Place 3 mini Cadbury eggs in each birds nest and put in clear party bags. Tie with twine or ribbon. 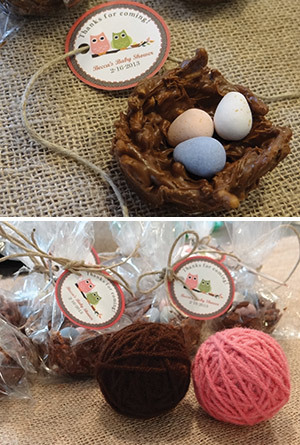 Another idea is to give your guests miniature birds nests that have been filled with chocolate eggs. Beaucoup sells birds' nests for around $1 each.